There appears to be growing confidence in the oil industry and beyond that the market is turning a corner in 2017, having bottomed out last year. I don’t share this confidence and can’t see oil prices rising this year, next year, or any time soon for that matter. Furthermore I think some of the indicators, which have led to the renewed confidence in certain quarters, have in fact been misread. Take the share prices of the Majors for example. Shell B shares went up by more than 50% in 2016 but in fact earnings per share during the same period declined by 34%. These share price improvements have been read as the first sign good times returning but they have more been driven by the Brexit-led decline in sterling and a lot of momentum investing which bears no relation to the fundamentals. In brief, I don’t see oil prices rising when there is so much capacity amongst the US shale drillers who will respond to higher prices by upping production, which in turn will tempt Saudi-led OPEC to flood the market again in response. Any shaky agreements between OPEC and Russia will come under pressure from excess global supply as well as from their own domestic economic issues which are set to get worse. Anyone who argues an investment lag now will lead to higher prices later must contend with BP’s own recent market report which stated that today’s known resources dwarf likely consumption until at least 2050. Where does this leave Africa? Not in a good place when you consider how expensive production can be, particularly in the deep water offshore fields like the pre-salt discoveries off West Africa which previously got oilmen so excited. To give it some background, the breakeven for deep water developments off Africa are on average $54 a barrel, which is among the most expensive in the world. Even the shallow water developments like those in Cameroon are at $36 a barrel, which eclipses the cost of the big Middle East producers whose onshore breakeven price is $8 a barrel, whilst their smaller offshore operations sit at $26. This demonstrates the difficulty Africa is in when you consider that Majors like BP are currently indicating that their own breakeven has risen to $60 a barrel. In this context, it’s no surprise that the oil industry in Africa has been hit so hard with the working rig count falling to a mere 18 units which is down from 66 two years ago. The knock-on effect has been painful with local service providers hard hit by the decline in activity and investment. The lower prices have also hit Government budgets especially in countries like Nigeria where oil accounts for 75% of fiscal revenues and 90% of total exports. This weighting has led to a damaging effect on currencies of the big producing nations, in particular the devaluation of the Naira in Nigeria and the Kwansa in Angola. With prices unlikely to recover significantly for the reasons given, it is also clear that there will be less investment and therefore no succour to local economies. Taking two companies who have been very active in Angola previously as an example; Chevron has cut its exploration budget by two thirds whilst ConocoPhillips is pulling out of deep water exploration altogether. Whilst there are some brighter spots further north in Cote d’Ivoire, Senegal and Mauritania, they cannot be relied upon to make a significant impact. So African economies will have to diversify. This is the difficult one and why I only set out to answer why these oil-reliant economies will need to diversify! But having argued that it’s of fundamental and immediate importance to diversify, it’s worth mentioning some of the areas this can be done. In the Middle East, countries like Saudi Arabia have focused their diversification on cutting government spending, particularly on bloated public sector worker salaries at the same time as promoting job creation. 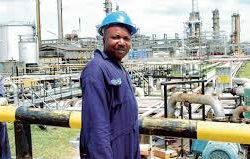 In the big oil producing economies in Africa, such as Nigeria and Angola, the situation is different and here efforts should be made to cut red tape and increase the ease of doing business. Measures like these will rapidly encourage inward investment and one country which has achieved this quite well already is Cote d’Ivoire. Another key area which gets cited time and again is infrastructure and the need for Governments to either invest themselves or to make Public Private Partnerships more attractive. Power projects normally come top of the list with transport close behind. In Nigeria for example of 56% of the population has access to electricity versus 85% in South Africa. Finally a key area for Governments to focus on is education, both in terms of reform as well as increased spending. Better education will lead to greater economic participation across the board but in particular in the key growth industries. A younger, more tech savvy generation will be able to lead sectors such as financial services, technology, manufacturing and other businesses which will help promote a more consumer and services based economy. Africa is becoming better known for its entrepreneurs; those who succeed even when economic conditions become more challenging. This dynamic is helped by the youthful populations across Africa, with approximately 63% of the population in Nigeria being under 24 years of age. This demographic will hopefully be at the forefront of the start-ups and new business units that will foster financial inclusion and provide consumer services to the growing middle class. As 2017 continues and, assuming the oil price does not improve materially, then all eyes will be on these start-ups, SMEs, and the more nimble Multinationals, to lead the way out of difficulty through innovation and a re-focus on new opportunities in high growth markets.